Is the new cat breed, the Lykoi Cat bizarre or beautiful? Just when I thought that there couldn’t be any new cat breeds making the scene to tickle my fancy, I nearly fell off my chair when I discovered that this isn’t the case. In fact, there is another breed hovering over the horizon and one that is getting ready to make a grand debut on The International Cat Association’s (TICA) show circuit. If you admire the charm and allure of the affectionate and highly intelligent Sphynx kitty – but at the same time secretly think that this cat breed appears somewhat bizarre – I have news for you. In the bizarre department the Sphynx can’t hold a candle to the Lykoi Cat. In my humble opinion, this newly developed kitty closely resembles an alien creature from outer space. According to the Featured Creature website and information found on the Lykoi website, when the Lykoi breeding program was being considered, testing was necessary to rule out any diseases or disorders causing the hair coat appearance. Veterinarian and Lykoi breeder, Dr. Johnny Gobble performed infectious disease tests at his clinic and DNA testing was done by UC Davis to ensure that the cats were not carrying the Sphynx/Devon gene. A DNA panel for genetic disease, color and blood type were also performed. Additionally, dermatologists discovered that the follicles that were able to produce hair lacked the proper balance of these components to maintain the hair. This oddity explains why the breed molts and from time to time become almost completely bald. After all tests were performed and all findings demonstrated that the Lykoi was the result of a truly natural mutation, lacking any credible evidence to prevent breeders from proceeding. Thus the formal Lykoi breeding program was started. The Lykoi was presented to The International Cat Association (TICA) in 2012, and passed to “Registration Only” status, making them a breed recognized by TICA. And while the breed is still considered “experimental”, this is the first step toward TICA giving the breed recognized “Championship” status. While I constantly profess never having met an “ugly” cat, as far as this writer is concerned “bizarre” doesn’t begin to describe this new breed. While all genetic and DNA testing found the cats to be perfectly healthy, I cannot wrap my head around the reason why the Lykoi is gaining such popularity. I adore the Sphynx. At least these cats are covered in a fine peach- down and are very pleasing to the touch. After you watch the video featuring the Lykoi cat, uploaded to YouTube by LykoiCat, do share your opinion about the breed with a comment. This entry was posted in Articles of Jo Singer, Cat Anatomy, fur, genetic mutation, genetics, Lykoi Cat and tagged birth of a new cat breed, cat breeds, cat genetics, genetic diseases, genetic mutation, Lykoi Cat, sphynx cat by Michael Broad. Bookmark the permalink. it is not man-made, and it is not a hybrid. the founding cats were discovered only weeks apart from eachother in litters of barn cats in two different states. The timing was right and the same vet was contacted about both litters and that gave us a foundation to work with. the outcrossing to black domestics is simply to continue to infuse healthy naturally selected genes until our breed numbers reach a level where we only breed lykoi to lykoi. There was no genetic engineering and no hybridization to create this. T.I.C.A. has a geneticist on the board and EVERY breed is screened and evaluated carefully and classified afterward. Ours met all the criteria to be called what it is, A NATURAL BREED. This gene is not new, it has appeared many times before and was previously labeled the “sparse hair gene”, but we were the first to decide to perpetuate it upon realizing that when they have black parents, the lykoi are born in the ROAN color,(the first and only known cat breed to have this color feature). As of September 2014 we are happy to announce that t.i.c.a. has upgraded our breed from “registration only/experimental breed, to the next step toward championship eligibility. We are now classified as a “preliminary new breed” and thus have the task of showing as much as we can to promote our breed and let the judges examine what we are breeding. I am a breeder of Lykoi cats. We simply adore them for their unusual look (we think it is cute) and their amazing personality. They received a flattering comment from one of the researchers doing medical testing on them who said it was “one of the healthiest breeds I have ever seen”. We are proud to raise them. There are 17 breeders worldwide and all of us are active in rescue or shelter work of some kind as well. We are cat lovers first and lykoi breeders second. Our outcross program mandates that we RESCUE otherwise homeless solid black domestic shorthairs (the statistically hardest color to find homes for)for use in breeding. After one breeding season each of them is altered and placed in loving forever homes, so we actually save a lot of cats from euthanasia. Also, all of our pet lykoi cats are sold to the public ALREADY ALTERED so as not to perpetuate or contribute to the feline homelessness problem today. Every breeder also has a “TAKE BACK” policy for the LIFE of the cat wherein kitten buyers who have life emergencies and are no longer able to keep their lykoi can return them to their breeder to be eventually placed in a loving forever home. Breeding cats can be done responsibly and with an eye to the health and welfare of your chosen breed and cats in general. Loving ethical people such as myself undertake this hobby for personal enjoyment and the preservation of unique breeds for future generations to get the same joy. That said, I must address the insinuation in some of the posts that we we are doing this for money. After medical fees, pre-breeding health screens, stud fees, show entry fees, feed, supplements, travel to shows, hotel rooms for overnight shows, odds and ends needed for daily care, and an emergency fund for those unplanned accidental injuries or possible C-section births, etc, RESPONSIBLE cat breeders make little (if any) profit, even at the high prices our kittens sell for. I hope that those of you who are not intrigued in positive ways by the look of the breed will remember that “beauty is in the eye of the beholder” and that many people really do love and appreciate them. Thank you. All I can say is why do people insist on playing with what mother nature made? I could not even watch the entire video because it made me sick. People should find a “cure” for other medical problems in cats and not destroy perfectly good breeds. Thanks for your comment. There are a large number of people who think just like you. And there are a large number of people who think it’s all right to mess around with nature. It always surprises me how how different people’s views are on the matter of breeding cats and particularly strange looking cats. It is obvious to me that it is wrong to breed cats like this. Other then to agree with Kylee, I really can’t think of anything to say, so I will keep my big mouth shut. UGH! In terms of his looks I quite like him but seriously we don’t need any more cat breeds for fickle human pleasure. I keep going back to look at these sweeties. They seem more monkey-cat like than wolf-cat like to me. All in all, I could still love them. Hell, I’ve love PEOPLE uglier than these! This seems like a fad to me, and I fear what will happen when it passes and what will happen to these kitties. These cats are just plain ugly, they look like they have mange and why would anyone want to own a cat that looks sick and unhealthy. This is something if I saw it in the wild I would be afraid to have it get close to any other animal. I would feel it should be put down for humane reasons. To continue to breed this abomination is ridiculous. Thanks to sharing Donna. We all feel the same way as you. Although, there seems to be a section of society who like cute ugly things because they’re different. Perhaps the breeder has targeted this segment of society. I am glad to hear that they are “natural” and not human-engineered. That said, I don’t find them among the most attractive of cats (I loathe dogs and all canids), but as they are CATS, I love their souls. We are told that this cat is the product of a genetic mutation. However, I have a sneaking suspicion that this may be a man-made cat, a hybrid. I like the point that you make that you still love their souls even though they are not attractive. I think that is a very nice point to make and perhaps all vulnerable and unattractive creatures should be loved more than others. I would be interested to know why you loathe dogs yet love cats because both are companion animals and of course both are animals. You seem to be saying that cat lovers need not be animal lovers. I wonder whether that is possible. Well, as I was born and raised with cats and have lived almost every day of my life with cats, I consider cats family members of a different species. I could go down the list of why I loathe dogs, but won’t. Just suffice to say I want nothing to do with them. Let me add my voice to the chorus that considers it obscene to breed such animals. As many others have pointed out, these cats look pathetically sickly and surely could not survive in nature, while meantime, so many perfectly healthy and beautiful cats are homeless. Sad to say, it does make you wonder about what’s the matter with people. Thank you, cousin Judy, for supporting the cause of common sense. I do not wish to be hostile or argumentative with the breeder, who is a veterinary surgeon, but it does seem to me to be rather self-indulgent to breed a cat at all, never mind a cat that looks sickly. When will folks learn to leave the animals alone. Stop messing with nature! When humankind learns a little bit of humility. I have doubts whether this cat is actually the result of a genetic mutation. I wonder whether this is in fact a hybrid cat. I say this because it is not just the coat that looks different, the facial structure is also different and when you look at the paws there is a similarity to the paws of the Sphynx cat, which has very long toes. I will do a bit of digging around to see what I can find out. I don’t know if I highlighted the information about the DNA testing to rule out any Sphynx or rex genes. According to the article that I researched the DNA testing ruled out any of these genes. I can say, with 99% certainty, that if this breed of cat were outside, picked up by animal services, and taken to a shelter, he/she would be killed immediately as being “sick”. Dee, that is a very interesting point. It is a point with which I agree and it highlights the fact that this cat, because she has a thin coat, looks unhealthy. This cat looks as if she has a health problem that affects her coat. There are many health problems that affect a cat’s coat. Accordingly, as you say, this cat would be deemed to be sick and euthanised. I guess they’d be the perfect cat for a Goth but I honestly don’t think we need more cat breeds or cats who need to be purchased when there are so many lovely cats who just need homes and people. I can understand that a cat has a strange look on occasion. Why make it a breed. 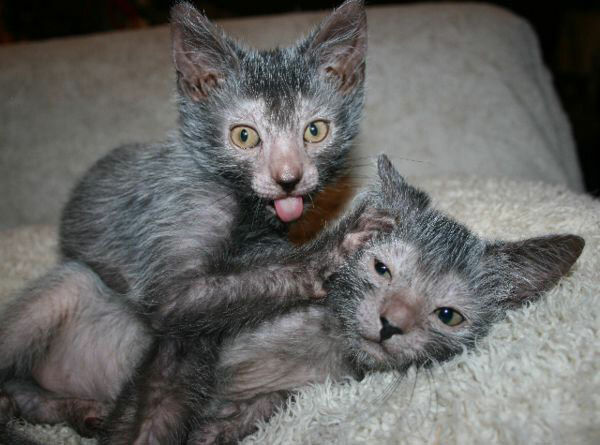 I had a cat that looked like these Lykoi. It was not a breed mutation but from anxiety and obsessive licking. It was terrible to see bald patches. Why breed a cat that “looks” ill? So many cats have been bred to a standard that is just plain wrong. Persians can hardly breath, Siamese have gone from hearty, healthy, beautiful cats to something you would expect to see stepping out of a space ship. It is the same with dogs and horses. It is disgusting. There are so many animals that desperately need homes and there are no homes to be had. This vet is beyond despicable that he would knowingly breed even more animals to sell! Must be nice to “Gobble” up homes that homeless cats need. He should be ashamed of promoting yet another mutated breed. Sorry but this is just as disgusting as de-clawing and de-barking. This reminds me of that woman in Texas a few years back that was raising Kangaroo Cats. Ugh!! Iniki well said, how I agree with you! Why breed a cat on purpose that looks sickly? Shouldn’t all cats look radiantly healthy and robust? I just don’t get it at all. Almost all the cat breeds based on mutations that resulted in abnormal coats have coats that are defective and which do not serve the purpose for which the coat exists. We do not see genetic mutations creating breeds with luxurious, dense, and glossy coats that are an improvement on what nature has bestowed upon them. Simple fact for its popularity, its a stand-alone among the various cat breeds in existence. Its bizarre looks and cute ugliness will be its attraction to wealthy pet owners. I am sure that “Maintenance Expenses” of this cat breed would be higher than normal cats as it would require special care. We humans are now “MANUFACTURING” our pets akin to cars and motorcycles. Bein a motorcycle fan i presume the Lykoi Cat to be a “Harley Davidson Bike” in maintenance and costs.When is the next breed being produced by the “PEDIGREE CAT CONVEYOR BELT SYSTEM” ? That describes it well. It is all about appearance. We are fascinated with appearance and are less interested in functionality and health the important things. Rudolph I bought a beautiful Enfield in India and rode it up to Himachal from Itarsi Junction. They are so plentiful there it’s wonderful. It’s hard to find such nice classic motorcycles here and much much more expensive. Huge money can be made shipping them west to Europe and probably north america. I totally agree with your comment regarding these cats’ popularity. They are, for the moment, almost one of a kind, which is desirable to a ‘collector’. The ugliness is cute certainly as kittens. And ‘collectors’ of animals usually pay alot – there is alot of money in it I guess. One day, you will have two explain to me your fascination with two wheeled vehicles. Do you like four wheeled vehicles as much? I think it is good, though, that you like two wheeled vehicles because they have less of an impact on nature and are you could say more natural. Michael I collect only bicycles because if everybody used one the world wouldn’t be about to end. I have only one very tiny motorized bicycle right now. I might consider another small moped to get around if I move to the countryside. I don’t have a licence for a car anyway. The answer that you have given is the one that I thought you would give and it is a very good answer. It fits in exactly with the character that I think you are. Marc, the first time i saw “MOTORIZED BATTERY CYCLES” was during my visit to Vietnam in December-2013. The “Battery Cycle” is rare akin to a Mercedes Benz in Mumbai but not uncommon. In India i have never ever seen a “Battery Cycle” although cycling as a hobby and sport is very popular since the last decade. I have posted a photo of a “BATTERY CYCLE” that i clicked in Vietnam. You might think of purchasing one of the same.Besides cats we do learn a lot of other aspects of living and life-style on “P.O.C”. IN PHOTO :- The Young lady is riding a “BATTERY CYCLE”. 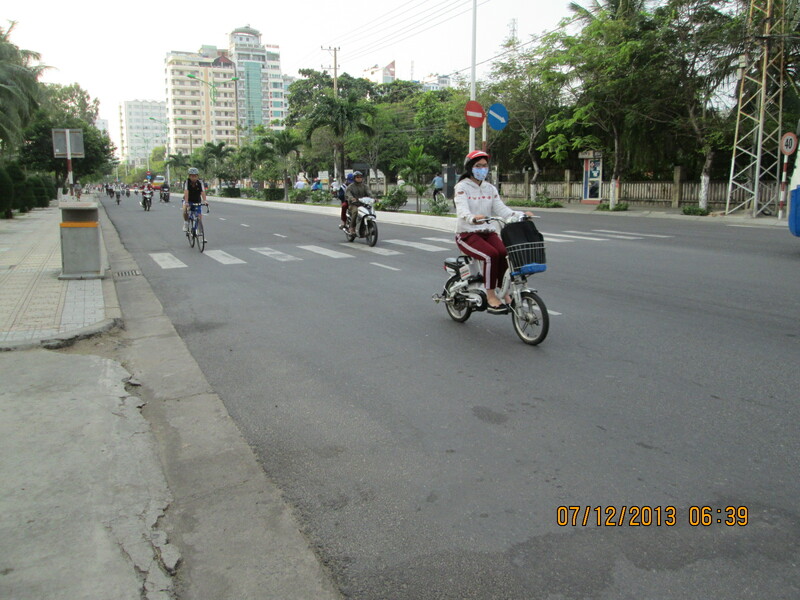 Notice the battery on the cycle.This locality is the beautiful beach resort city of Nha Trang. Royal Enfield motorcycles are prized in India and were and still considered one of the best brands in the Country before the setting up of “Harley Davidson” distribution in India.I have been to Shimla and Manali in Himachal Pradesh, beautiful countryside hill terrain for leisure motorcycling, although dangerous. Nice to read that you enjoyed your visit to India, a country that has all the World’s geographical climatic conditions within its boundary.On you next visit tour the desert regions of Rajasthan or the beaches of Kerala and Goa. If interested in short “Hill Treks” then Mumbai is the ideal place for day trips to “Hill Forts”, slightly less strenuous than climbing in the Himalayas ! As for exotic designer cats, seems they will never go out of fashion but sadly the genuine “BIG CATS” of the World’s forests might become extinct in the wild in the near future due to habitat destruction.Next, any designer cat breeder thinking of manufacturing a “DWARF TIGER, PANTHER OR LION” in the animal genetic laboratory ? Have i given them the idea? The Royal Enfield was made at a time when made in Britain was prized. Great Britain led the way in motorcycle manufacturer at one time, sadly no longer. I enjoyed my visit to India as well. I like India. This mutation does not assist the cat in survival so it would not succeed in nature but humans don’t bother about that. The coat looks patchy and thin. Not good. Thanks for spotting this Jo. Well done. This is a new genetic mutation. One of the cat breeds created out of a mutation. As you say the Sphynx is perhaps the best know and the Rex cats are also similar to this cat in that the mutation affects the coat. At least breeders can’t create a new breed through hybridization because the line up of breeds is crowded already. This cat might get some fans because the appearance is interesting although it is not attractive but the coat is patchy and thin like the Rex cats. The Rex cats are not that popular. People don’t always go for attractive. Anything that stands out will do seems to the rule nowadays. Personally, I’d wish breeders would stop making new breeds even if they have been created by a natural mutation. Kylee I couldn’t have put it better myself, I’ve nothing to add to your sensible and intelligent comment. IT’s true – none of the ‘modifications’ have any natural advantage – if anything they are a disadvantage. Therefore it is not good. There are not cats which could survive out and about I assume – either because of sunburn or cold. Is it true that every cat breed is less able to survive than a random bred cat? Probably true. This is an example of how man’s intervention of nature results in something less good but people prioritize appearance over function which shows me how shallow humankind can be. While the Rex coat developed from mutation- it looks like a cat! There are three varieties of Rex.. the Selkirk, The Devon and the Cornish. My favorite one is the Cornish and is considered generally a breed that is healthy. But just like humans, any cat is at risk of developing a genetic medical condition- if that gene is passed on by the parents. The one problem with the Cornish Rex is that the coat offers little protection from the sun, so they are at risk of becoming sun-burned. That is easily prevented however, by not allowing them to bask in the sun for excessive time periods. I love the feel of these kitties, which to their human companions are one of the most affectionate cats in the world. I don’t know about the popularity of the Rex outside the USA, but they are growing in popularity here in this country. Although I am ambivalent about the Rex coat because it is not an improvement on nature, quite the contrary. I do have a soft spot for the Devon Rex. As to the Cornish Rex, that, for me, is too slender but that is a matter of pure personal choice. You like slender cats and I totally see that. There are very elegant. Elegance and refinement are two of the objectives of the cat fancy.